Are you one of those kids who used to sit in the sandbox every day at recess, always digging the same hole? Or maybe you were the kid who picked up shiny rocks and always asked if they were gold. Or perhaps you just like making people unhappy by ruining all of their hard work. If any of those apply to you, I may have found a game you’ll want to play. Claim is a 2-4 player card game from FPE Games. Set in the Old West, you’re all prospectors, hoping to find your riches. Each player starts off with three cards, as well as a card labeled ‘secret stash’. 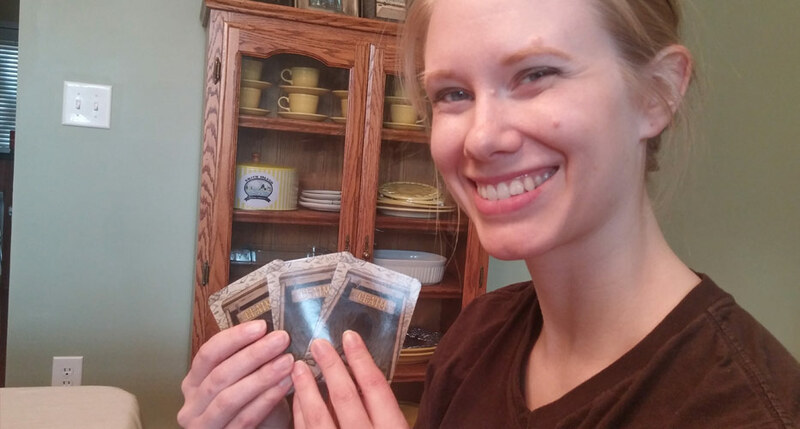 On a turn, a player can choose to place or switch out a card in their stash. They may also play cards to use their actions, which often impact other players’ hands and stashes. All of this is done in search of the gold nugget, one card in the deck of 30. Whoever has the gold nugget in their hand or stash at the end of the game wins! Now, normally I don’t call out the artwork on a game. Usually I don’t even notice. However, this game’s artwork is fantastic. The happy, colorful illustrations can be smile-inducing all by themselves. They’re coupled with silly but appropriate card names and quotes. All of these card elements help to set the mood immediately. The game is not taking itself super seriously, and so you shouldn’t get overly analytical, either. In fact, if you’re not talking in over-the-top Wild West voices, then I don’t think you’re doing it right. That’s not to say that there is no strategy. Much of what you do in the game is going to center around bluffing. If your face can’t successfully hide surprise, frustration, or happiness, you might not do well. I’m obviously still working on it. You’ve got to convince those around you that you don’t have that gold nugget, or maybe that you’ve put it in your stash when you actually have it in your hand. There are also some hand management elements here. Certain cards are best played at the beginning of the game, while others need to be kept in your hand for some last round shenanigans. Can you think of a better place to keep your treasure? I only had one issue that popped up in the game, and that is when the gold nugget gets discovered. With some of the cards, the nugget gets placed at the bottom of the deck. This proved to be a problem if it took place too early, like in the second turn of the game. Two of the three players then knew where the nugget was, so the majority of the game was spent killing time until the last few cards in the deck. This didn’t completely ruin the fun, but it made much of the game seem useless. We simply added a house rule to shuffle the cards whenever the gold nugget is returned to the deck, and that seemed to make things better. Claim probably won’t be the center of your game night. You’ll also have to be careful playing with those who get overly sensitive about games with ‘gotcha’ elements. However, I think this is a fun way to get started, or maybe a quick game a few people could play while they wait for others to finish. I also think that it would be a great introduction to bluffing games for younger players. While I don’t have any kids running around my house, I do hope to break this out with some of my students in the near future. All in all, if a light-hearted game where you get to lie to your friends and family sounds like fun, I believe Claim could be a strong addition to your card game collection. You can help fund Claim: The Search for the Gold Nugget through Kickstarter starting on February 13th by clicking here. FPE Games provided us with a prototype copy of Claim ahead of their Kickstarter launch. This in no way influenced our opinion on the game. Previews are a glimpse into an upcoming game with the pros and cons that we experienced prior to production of the game.